A book unlike any other ...a pre-cursor to a new age. It is destined to foster a new mentality, that will bless individuals and families for generations to come! What are The Psychological Truths ? As outlined in my book The Psychological Truths are simple yet powerful and accurate thoughts that lead to actions. When the two come together we are able to function at a level that is us at our very best! These truths touch every part of our lives and they effect our sense of confidence. We are largely unaware of these truths, despite the fact that they manifest themselves everywhere. Too often it is the case that we will not see what is both plain and consistent. Being aware of what is true ensures a sense of calm. But to violate these truths will certainly result in a pathology who's hallmark is doomed to repeat the same unhappy results that are so prevalent in most individuals lives. Each truth beholds characteristics, if obeyed, they will empower and strengthen us. Or, it can be a great source of pain each time we violate those same truths. When in a moment of crises or confusion we correct our thinking and align it with that Psychological Truth that speaks to the moment...the pain simply vanishes. When we are aware of The Psychological Truths on a conscious level, we may apply them deliberately and with purpose. This will vastly improve our skill in the navigation of our daily lives. Never before have these truths been revealed in such a concise and practical manner as they are in my book. The Truths have now been laid out in practical language that will materially effect the human family as a whole. Quality of life will increase as we advance more skillfully through our mortal squabbles . Small and great challenges alike will topple before us as we partner with those truths. They will always yield the same result as we arm ourselves with them in a moment of question. 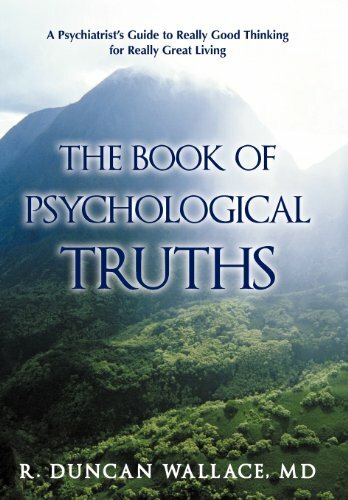 Contained in the book are more than 40 Psychological Truths that will make certain the best functioning you of your life. The Truths are outlined here in families or groups that we will recognize, and can relate to. The first category is comprised of the frequent, often daily emotional pains we experience. It starts when we feel there has been a loss of power from "mental-pressure" , "personal stress", and painful emotional surprise. All pain can be eliminated immediately by implementing that truth which belongs to that area of functioning where we are exhibiting a deficit. The second category deals with truths that speak to belonging and accomplishment. Our motivations and sense of purpose are key here. An awareness of these pitfalls that await us sends us to meet them armed with an immense capacity that allows us to correctly identify and perceive the world we are immersed in. An important note is that relationships and social functioning are at the heart of this second component. Lastly, are found more painful complexes such as depression, despair, and long-term guilt often accompanied by regret. These are all learned repetitious cycles of behavior. The choices we make in attempting their resolution, most often, repeatedly, creates chaos. and fills our lives with pain. However, the appropriate Truths will answer and cure every one of them. They promise us that if we obey, they will always provide us with an increased understanding and a new path for growth. The Psychological Truths, as they have always existed, will if we allow them to, center our actions and decisions. They will mark our path with monuments like wisdom, capacity, and ability rather than leave a string of chance circumstances that in varying degrees dictate most of the outcomes that we ultimately find ourselves resigned to.